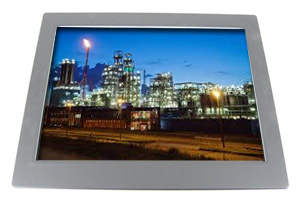 AbraxySys Industrial LCD Flat Panel Displays are ideally suited for various harsh environments where dust, dirt, moisture, splashing water, hose directed spray, and various other caustic contaminants like oil, chemicals, etc. Model PS-215 is a high-quality industrial LCD system offering NEMA 4X (IP66) level protection at the front bezel. The product boasts a 21.5" display size with 1920 x 1080 pixels, 250 NITS brightness and 5000:1 contrast ratio. The unit is constructed of an all steel nickel plated rear chassis design and stainless steel gasket-sealed front bezel. Model AS215P4X rugged panel mount display is designed to provide hassle free and easy integration. The unit features three mounting locations per side allowing for super-sealed panel mount protection.